So my kitchen this week has become “Holiday Preview Command Central.” If you are coming and haven’t gotten your tickets yet, here is a good reason to get them TODAY. Unbeknownst to Jen, I left the $25 pricing up on the PayPal button. Now that I’ve outed myself I have to fix it, but am willing to take the obligatory flogging if you order some tickets!!! And if you can’t come to the party, remember the party can come to you! Order your “portable preview” to get all the recipes and yummy protein shake samples. On to the day’s business. Since I’m so busy this week I am on what I call “fridge lockdown.” I am trying to use what I have on hand for food this week. Fridge space is at a premium and I certainly don’t need to add to it. Well Saturday morning I was cleaning the kitchen and discovered three ripe, but still usable, bananas. For me that can only mean one thing: PROTEIN BANANA LOAVES!!! Shouts to Michelle over at “The World According to Eggface” for introducing me to the methodology of baking with protein powder. I whipped up a batch of loaves Saturday morning and guess what? By this morning when I went to snap a pic (on my camera phone unfortunately…long story…) there was only one left! The divas love these things. So do the people who come out to Pouch Parties. 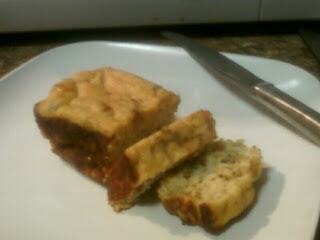 It seems almost too good to be true–banana bread with no flour??? How can this be? Well it can be and it is and I’m going to tell you how! In a bowl, mash up bananas and add eggs and milk. Set aside. Mix wet and dry ingredients. Your batter should be pour-able but not too liquidy (like pancake batter). In yet another bowl, combine a tablespoon of protein powder and the nut pieces and shake. This keeps them from settling to the bottom of your batter. Add to batter. Pour into a sprayed mini-loaf pan, (I use this spray…it helps with extraction) and bake in a 350 oven for 15-20 minutes or until a fork inserted into the center comes out clean. They’ll be very puffy out of the oven but will settle down as they cool. I store them in snack-sized zip-top storage bags for grab and go convenience. Obviously it’s a little too convenient because two divas discovered my bread and ate it all! POST-NOTE: I’ve been asked several times if this recipe works in a traditional loaf pan. Thus far I’ve been unable to make it work. The outside cooks faster than the inside so you either get perfect insides/burnt outsides or perfect outside/goop on the inside. But who knows, maybe YOU can crack the code! First time baking w/protein powder – I tried this recipe – AWESOME – thank you!! Just made this for the second time! I made a few changes and I love this bread. Here is my changes: added 2 tbsp brown sugar cinnamon sf syrup ( used caramel before) 2 tbsp multigrain pancake mix to make up for added liquid from syrup. I also like the added texture this offers. I baked mine in mini bundt pans and they are so cute. I wrap each one and freeze them then microwave to serve. The best part is adding a small ( like tsp) butter to the top and topping it with a tbsp sf maple pancake syrup. YUM!!!! Tastes like a banana pancake and this way I get a protein breakfast! Thanks for all your great ideas! Look at you, playing with your food! Sounds like you made great modifications. Glad you like! I want to make this recipe and have a question. Does it matter what protein one uses for cooking? I use Syntrax Matrix 2.0. It has a large scoop that has a half-scoop mark. I guess i am asking if any size scoop will work for the recipe? Great question. I wrote this recipe before I became more cognizant of such things. Having said that, the protein I use is 33g per scoop. So the above recipe would call for 180g of protein powder. So look on the nutrition label and see how many grams your protein powder scoop holds and adjust accordingly! I don't think the ingredients in the protein powder have enough variance to make much difference on the yield. I've used whey concentrate, isolate and soy protein and the recipe came out the same. Thanks it does. I will have to order the mini loaf pan. I often have too many bananas to eat. I am looking forward to trying this recipe and will update you on the results. Have you ever tried using egg protein powder? Have any thoughts on baking with it at all? I just tried this recipe and my bread ended up being really soggy out of the oven (even using a mini loaf pan) Has this happened to you/do you have any tips for fixing this in the future? Sounds to me like you may have had too much wet ingredient, too little dry. This hasn't happened to me with this recipe but has with otherwise especially if my bananas were really REALLY ripe. Adding more dry stuff (baking mix, protein powder, etc.) should help.